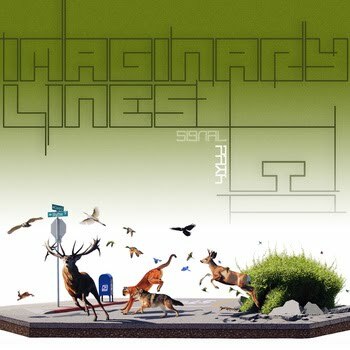 Signal Path’s latest release, Imaginary Lines, is a well-crafted collection of new tunes from the adventurous electronic duo. Released on September 1st, 2010, the album features nine new tracks available for free download at www.signalpathmusic.com. Consistently pleasing throughout, Imaginary Lines takes the listener on an extended auditory journey by offering powerfully constructed twists and turns while avoiding electro-induced clichés that often inhibit exploration. With running lengths between two minutes and eight minutes, the tracks on Imaginary Lines are both well-conceived and executed to the highest degree, offering a vast soundscape for those willing to surrender their psyche to Imaginary Lines. If Signal Path’s 2009 free release, C L A S H, marked its reemergence into the music world as a sophisticatedly important duo, Imaginary Lines is indeed its reaffirmation of such praise. Ryan Burnett (guitar, production) and Damon Metzner (acoustic drums) have come together once again to bring some much needed balance to electronic music. Haunting yet undeniably welcoming, Imaginary Lines takes old forms and expands on them with a level of energy and brevity that demands instant attention. Unlike many recent electronic albums whose messages are impeded by a lack of conciseness and general direction, the duo does not overextend beyond its own capabilities. Signal Path moves with a refreshingly swift confidence throughout the album’s course, and in doing so, has created something fresh and exciting by trusting and utilizing its strengths in both rhythm and melody. By staying true to itself, Signal Path successfully implements a variety of musical ideas on Imaginary Lines. Tracks such as the beautifully visceral,” Cree”, and the spaciously melodic, “Slow Your Thoughts”, move the listener with a rare combination of energy and fluid elegance. Other offerings such as the playful “Mystery of the Yeti” and the darkly driven “Verbal Yes” require a bit of work from the listener in order to can keep up with the logically challenging polyrhythmic expressions contained within. As a whole, the album offers the listener a uniquely developed sound that Signal Path can truly call its own. A perfect mix of glitch, grit, and melodic gorgeousness, Imaginary Lines is a full serving of delicious wook filth as it displays the hard-work of two artists who have found their calling in today’s electronic scene. The wookies have called... Signal Path has answered. Signal Path, Verbal Yes from RECTV.NET on Vimeo. haha, NICE ! Love it!